JNN 10 Mar 2014 Beijing : In the central Chinese province of Henan, the scene of a woman leading prayers in a mosque for women only would not be a strange one. “It all started because Muslim women wanted to learn basic religious studies,” researcher Shui Jingjun, who is also Hui Muslim, told ABC News Australia on Wednesday, March 5. Over the past decades, Muslim women have been leading prayer and teaching Islamic values to worshippers in Henan province mosques. One of those imams, Ge Caixia, leads prayers for some 50 elderly worshippers who usually attend Friday prayer. Standing at the middle of the first row, she leads all prayers in the women mosque with the exception of funeral prayer. According to official data, China has 20 million Muslims, most of them are concentrated in Xinjiang, Ningxia, Gansu, and Qinghai regions and provinces. Unofficially, Muslim groups say the number is even higher, stating that there are from 65-100 million Muslims in China — up to 7.5 percent of the population. 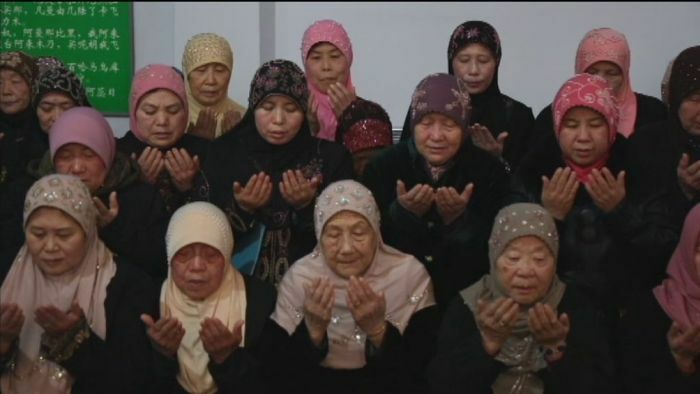 In general, during Muslim prayers, women may not lead men but may lead other women, which is the case of females leading prayers in female-only mosques in China. In Islam, the majority of jurists, Including Fiqh Jafria maintain that a woman is allowed to lead her fellow sisters in congregational prayer if there is no man to lead the congregation. Though female imams were not new to China, finding a new generation to lead prayers was not an easy task. The four students that Ge Caixia last trained have all left to pursue other opportunities. One of them is married to a male imam and looks after affairs concerning the Muslim women in their mosque. “It’s not realistic to expect the young to give up their career to become a female imam,” Ge Caixia said. “Being a female imam requires special expertise, you must have a very deep and thorough knowledge of the religion and have the confidence and responsibility to fulfil this calling. This entry was posted in Asia Pacific and tagged ABC News Australia, Chinese Muslim Women, Ge Caixia, Hui Muslim, Muslim prayers, muslim women, prayer leader. Bookmark the permalink.